When Clayton Lockett’s vein collapsed during the attempt to execute by lethal injection in Oklahoma last month, officials had no precedent to follow. Within an hour, Lockett died of a heart attack, which, from what I have seen in others having heart attacks, must have caused a great deal of suffering in the death-row inmate. For the last couple years, an alleged shortage of one of the key ingredients to the three-drug cocktail used for most lethal injections has forced lawmakers around the country to pursue alternatives. In fact, sodium thiopental has become so rare most states have little to none left, despite large populations of inmates awaiting their executions. For some state lawmakers, however, the solution is simple. 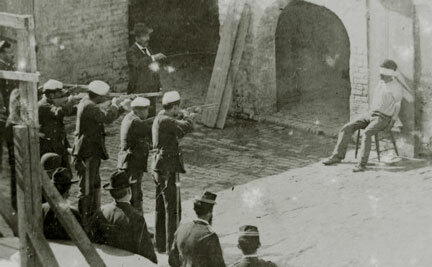 Rep. Paul Ray, a Republican from Clearfield, Utah suggests a return to the firing squad, where, he claims, “the prisoner dies instantly. It sounds draconian; it sounds really bad, but the minute the bullet hits your heart, you’re dead. There’s no suffering.” You can read the entire AP article reporting Rep. Ray’s position here. First, I have to agree, in part, with Ray’s claim. Once a bullet hits the heart, that person is dead. However, the time it takes for that person to die is debatable. While the heart pumps oxygen-rich blood throughout the entire body, including the brain, higher brain functions likely do not cease the moment the heart stops beating. Perhaps even more questionable is the opponent the AP article uses against Ray’s argument. Michelle Price cites Richard Dieter, executive director of the Washington, D.C.,-based Death Penalty Information Center (strictly opposed to capital punishment) saying that “things can go wrong with any method of execution.” Dieter supports his case with one of the most obscure examples he could have possibly dug up. Price says, “He cited a case from Utah’s territorial days in 1897, when a firing squad missed Wallace Wilkerson’s heart and it took him 27 minutes to die, according to newspaper accounts of the execution.” Is that really the most recent example Dieter can offer? He basically made the case for Rep. Ray’s reinstatement of the firing squad. I mean, look how rarely these are botched. I am going to be nitpicky now, probably because I oppose the death penalty. Rep. Ray’s own words do plenty to condemn the general practice. It is not just the firing squad that “sounds draconian.” The idea that any civilized society needs to resort to killing individuals as punishment is plenty draconian. However, at the end of the AP article Price quotes perhaps the most damning words from Rep. Ray’s own mouth:“There’s no easy way to put somebody to death, but you need to be efficient and effective about it.” Ironically, killing someone is easy. We have developed far too many “efficient and effective” methods for killing people, and though they may not all be unusual, they are all cruel. If we continue to treat human beings like animals, they will act like animals. Truly, from a moral stand point, “there’s no easy way to put somebody to death.” Rep. Paul Ray needs to weigh his own words carefully. The problem is not in the method but in the practice. « There is an “Immanuel Kant Song”! I don’t believe in the death penalty, but if we are to have it, it should be personal and immediate. Firing squad does that.